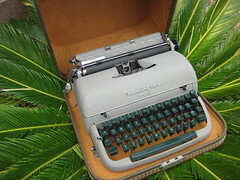 I know this newfangled blog wasn't meant as some sort of retromechanical Craig's, but this seemed like the best place to make an offer: I have, right now, a Remington Quiet-Riter that is not seeing any use. Rather than let such a beautiful machine languish in a corner, gathering dust, I will send it free to the first person who requests it. Just pay whatever shipping fees are involved. Respond back here if you are interested. I don't get paid until Friday, but if the costs aren't too much I'd be glad to take her off your hands! In fact, I can even send you a UPS label all pre-paid (I get a discount through work) if you let me know the weight after you pack it up. Beautiful photography work there, Mike! The color and composition of the ferns is quite elegant. Ah well, I cannot take credit for it. My wife, Gen, is the photographer of the family. I am simply her humble student. That is a great picture - kudos to the wife! Ugh! I was too slow! This is what happens when I get off blogger for one day; missing out on a nice typewriter! They're great, solid machines. I recommend everyone try/buy one.